You know that saying, ‘You don’t know what you don’t know’? Well those who haven’t been contemporary first can’t understand the drive to hop/switch yesterday, BUT the reality of investing at a time of life when there is more to the story than just what YOU want to do is daunting. You’ve been teaching and working all these years, going to conferences and keeping up the CEC’s, buying more apparatus and all the cool toys that keep getting invented, getting certified in different but similar modalities, ’cause it’s fun, looks cool, will get more clients in the door, the ROI is in sight…” …And then you try a classical workshop, class or lesson, and you can’t shake off the feel of the difference. How is it so much the same and yet at the same time so completely different?!?!?! The feeling of all those years and dollars poured into something that you thought was the real deal! And it was … until it wasn’t. Disclaimer: Once again this is about my journey, and I am NOT making any statements regarding whether or not the contemporary way is or isn’t Pilates. Each person is on their own journey, this is my experience. I LOVE all the trainings I did, all the classes and workshops. But I can’t, in all honesty, turn back to those days again, the exception is taking a class for fun from any of my friends who teach different things. So, since my hike down classical lane began, I have read, studied, taken lessons, taken classes, taken workshops, watched videos, asked questions, sent emails, participated in every FB forum that I could get help or advice from … and my library???? My library has gotten larger even as I’ve purged what no longer works for me. I’ve bought and sold apparatus, traded up, bought previously loved, and sent my babies on to good new homes, with joy and tears. Change doesn’t come easy, even if it’s a welcome one. 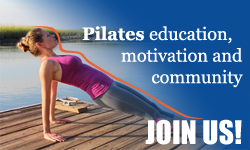 I’ve been told by well respected resources that you don’t need to get re-certified, join clubs and organizations, or belong to anything to be a good or even great Pilates teacher, whatever your chosen style. Learning well IS. However people are joiners and want to belong, so there will always be organizations out there to join. Read the fine print… What are you getting for your hard earned $$$? You can pay for big large, fun parties, and stuff some pockets…But if you are anything like me, I spend SO freakin’ much on education, apparatus, books, lessons, etc. that I finally wanted to figure out how do I keep on my learning path and still pay the mortgage, buy the kibble and vet bills for 3 senior Great Danes, help my kids here and there, and travel to visit my grandchildren so they’ll know who I am. Not to mention try to just have a life. My husband is great, he thinks I’m awesome, he doesn’t understand relearning something he thinks I know so well. Taking time and money away from family so I can travel to learn isn’t always in my budget financially or time wise. Traveling involves my husband having to pick up even more of the load than he already carries with his job as a Cardiac Critical Care RN, and his side job of roof repair, while I try to market and find clients for my home studio. Wish they would magically want to find me and come do Pilates, but where I live, it’s more like pulling teeth, since at every local gym, they can take a mat class for free, or there are the Clubs that offer the $10 apparatus classes that they call Pilates. SO, I wanted to find a way that really hones in on the education I want to get from the people I want to learn from. I go to smaller Intensives, yes occasionally there’s some travel, but it isn’t weekly for a year. I also realized that everyone has bills to pay, and my money is as green as everyone else’s, so I grew a pair and started asking Pilates teachers who are the international travelers, and teachers of teachers if they would teach here, at my small home studio. NO ONE has said no. They tell me what their fee is, and because my studio is at home and only 300 sq feet, I opened my workshops up for people to Skype in or get a private video link, so others without deep pockets on a similar path can also learn. I do my best to make sure everyone stays connected via Skype, but technology being what it is, I’m happy that I also send the video link to anyone who has paid to attend. The video is raw footage of every thing that happens during the workshops, every Q & A, bad shots and bloopers, but you don’t miss a word. If something isn’t clear, I ask for people to email me and I forward all the Q & A’s to the presenter, and when I get the responses, I forward them to everyone who attended whether in person or cyber. I recommend this method, even though it’s a helluva lot of work on my end. So don’t be afraid to try this where you are, OR feel free to join in on mine. There has been an enormous amount of trial and error, the first few cost me, the next few I broke even, and the last couple, I began to make a bit of a profit. I don’t recommend it for the meek. The marketing is extensive, the set up is a challenge, organizing calendars and making sure you get the money in to pay the presenter are huge anxiety provoking factors. This way people in other time zones and hemispheres can learn on their time, I am also trying my damnedest to promote Share Shops and I encourage others to do the same. Practice and learn and teach each other, bring something to the table and sharpen your skills with other teachers to watch, spot, and cue as you do the same for them. Keep the learning going. For those of us that have to go slower, I present hosting your own intimate workshops, tailored around where you specifically need the growth as a viable option. It isn’t perfect, but it beats NOT doing it at all and then being remorseful that you didn’t give it a shot. In a year, you’ll still be doing the same thing unless you change something. Be brave. Build your own bridge, if that’s the way you need to go. A side note to your clients who wonder why you may need to increase your fee a bit~ You didn’t learn in a weekend and they won’t either, and there was a Joe & Clara Pilates. An actual man is the genius behind the method, and it is a specific method as outlined in Return To Life. So the money you charge does go directly back to the client, it just changes form. Your teaching just got stronger because of their contribution. They reap the rewards, and your world just expanded. I couldn’t agree more with this article. I’ve been teaching for over 20 years, got my primary education with Polestar. As i joined FB forums, i have a deep hunger for a classical education on Gratz equipment! Please add me to your email list as im very interested in doing Skype workshops! Thank you for this article. I totally agree with you and find your story very similar to mine. I know these shared stories like yours inspire others too. Please add me to your list. I would love to participate in your Skype workshops. Hi Nina, I will gladly add you to the list.. You can also shoot me an email studio_s@icloud.com if you want more info about the workshops. One great thing about having contemporary Pilates certification prior to Classical Pilates training is knowing the difference between the methods. I’m going through Classical re-training with the intention of recertification right now and yes it is daunting. It’s been very encouraging to meet another teacher in my area who at 45 is doing the exact same thing. Interestingly, most classical teachers that I have met over the past year have never taken a contemporary lesson and know very little about it or what the difference is. So this whole process is challenging, expensive and totally taking me out of my comfort zone but I know exactly why I have to do it and am in the unique position of having experienced both kinds of training. It’s truly staggering how different the two approaches are and how much more complete and empowering classical is. Thanks for this post! Thank you for sharing your your experience Kerry! Good luck with your recertification process! Kerry, yes I agree, having the contemporary experience and now the classical one, is like having an extra set of magical wrenches in the proverbial toolbox… and the methods are as similar as they are different.